Water Poppy (Hydrocleys nymphoides)and is a monocot, meaning that it has only one cotyledon inside its seeds. very good plant in you outside ponds. They have many floating 2"-3" yellow, poppy-like blooms the center of the flower is a brownish-red color, and 2" to 3" dark green lily-like pads. The flowers will grow all summer long and will Grow in 4" to 12" water depth. Flowers of the plant that will have between three and six petals, and the vascular tissues are grouped together in bundles with in the stem of the poppy. 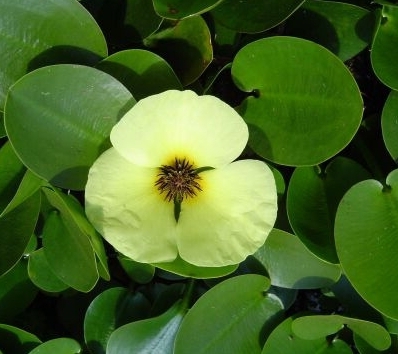 Water poppy will float on the water surface, but root-ball they should be planted in soil for better blooming. The plants with roots will grow all over the ponds surface. The family of Alismatales, containing three types and seven groups of tropical freshwater plants.